National Library Week is April 10-14 and the State Law Library has several free classes and social events. Stop by our downtown Madison location for a presentation and Q&A on Ballotpedia, happening Tuesday at noon. And on Thursday, head to the library for socializing, coffee, and pie from 1-3. Every visitor to the library during the week can play our guessing game to guess the number of pretzels in the display at the circulation desk. The closest two guesses win a prize! Monday, April 10, Noon - 1 p.m. Learn first hand how to find public records on individuals and businesses in this information packed class. Discover criminal records, state and local court records, business entity records, liens, real estate records, and more. We'll help you find the government agency sources for Wisconsin public records. 1 CLE credit. Ballotpedia is an online encyclopedia of American politics and elections. 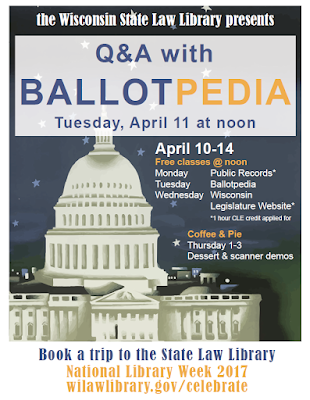 A representative from Ballotpedia will present an overview of the website and field questions from the audience. Wednesday, April 12, Noon - 1 p.m. In this hands-on overview of the Legislature's site you'll learn how to track legislative activity, locate bills and acts, and search the online Wisconsin Statutes. You'll also learn about the Legislative Notification Service, and where to find publications of the various Legislative Service Agencies. 1 CLE credit. Thursday, April 13, 1 - 3 p.m.
To cap off National Library Week we're hosting a coffee and pie social. Library staff will be available to give demonstrations of our new, free public scanner.